He grew up with every advantage; he lived in the most expensive house, had the best chefs preparing his meals, the best private tutors and they were grooming him for a position of national power. He had it all, but he took advantage of that power and murdered someone. He had justified his actions in his own mind that this person deserved it, but he had gone outside the law making him an outlaw and an outcast. We’ve all found ourselves in circumstances like this when we choose to do something questionable because we can justify it in our own mind, but when others find out about it, we are exposed for what we really are. When we choose to do something wrong, it hurts our relationship with others, brings some kind of punishment and it hurts our relationship with God. 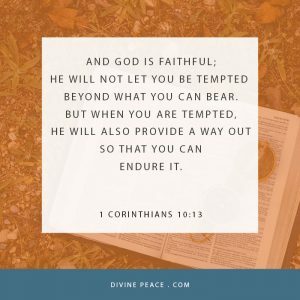 In our second lesson from 1 Corinthians 10, the Apostle Paul reminds us that when tempted, hold on to God’s faithfulness! The Corinthians had every advantage having been baptized, given the Lord’s Supper and the message of Jesus’ life, death, resurrection, forgiveness and the hope of eternal life, but they were not out of the wilderness yet. 6 …these things occurred as examples to keep us from setting our hearts on evil things as they did. And these words of Paul reach beyond the Corinthians to all believers. We all face choices to give into temptation or to turn to God to help us fight against it. As Paul explained this, he used the term “ignorant,” from the Greek word ἀγνοέω like agnostic, someone unaware or not sure, to show that this possibility of falling away from faith by giving into temptation must be understand. 9 We should not test Christ, as some of them did—and were killed by snakes. This happened when a group led by a man named Korah turned against following Moses and God, but God made it clear that Moses was the leader of Israel by having the ground open up to swallow Korah, his family, his followers and all their possessions. Paul’s four warnings all corresponded to sins the Corinthians struggled with and with ours. 11 These things happened to them as examples and were written down as warnings for us…12 So, if you think you are standing firm, be careful that you don’t fall! 13 No temptation has overtaken you except what is common to mankind. The temptation that ultimately affects all of us, that Paul was making us aware of is pride. 13…And God is faithful; he will not let you be tempted beyond what you can bear. There is nothing for us to do to be forgiven and saved. God has done it for us, but we can do something to lose what God has given us. 13…the full armor of God, so that when the day of evil comes, you may be able to stand your ground…14…with the belt of truth…with the breastplate of righteousness…16…the shield of faith…17…the helmet of salvation and the sword of the Spirit, which is the word of God. 28 for the forgiveness of sins. 13…But when you are tempted, he will also provide a way out so that you can endure it. God provides his Word and the sacraments to give us the strength to keep our faith even when temptations threaten to take it away from us. We have all been given everything by God and he wants us to hold on to all he has given us by fighting against temptation. He wants us to fight without pride, but with complete trust in him. May God be with all of us, so that when tempted, we hold on to God’s faithfulness! Amen.